Paul Stutzman is the author of Hiking Through . 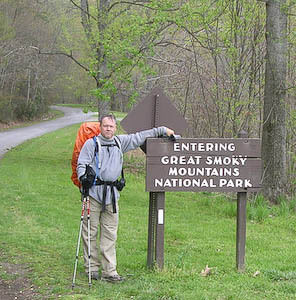 A year after his wife died, Paul decided to fulfill a long-time dream of hiking the Appalachian Trail. The book is a memoir of his experiences on the trail, which became a spiritual journey as he hiked alone with God. Paul graciously agreed to an interview. Read on to find out more about Paul’s journey with grief and with God. 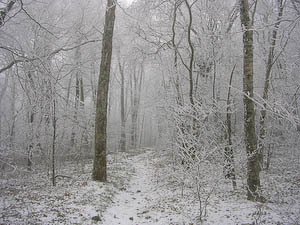 First, tell us a bit about the year after Mary died and how you came to the point of deciding to hike the Appalachian Trail? The days following the funeral passed by so slowly, that I could not even imagine a year without my wife. On my way to work every day, I would pass the cemetery where Mary was buried. As soon as I neared the cemetery my mind was immediately drawn to her gravesite. As the year wore on, I gradually found myself past the cemetery before realizing it. I started measuring my recovery by that gauge—how far was I past the cemetery before I thought about that grave? It took one year to really comprehend that she was not coming back. Although I achieved a certain level of healing, I felt I was stuck in some kind of holding pattern and I needed to do something radical to jolt my life back on track, to move forward. 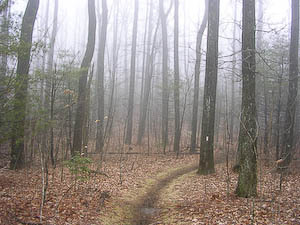 I had dreamed about hiking the Appalachian Trail for many years. Although giving up my good job was the hardest decision of my life, I really felt God was telling me it was time to give up everything and take a walk of faith. I now tell folks that I took a hike from life and it changed my life. On the trail you met quite a number of men who were also grieving losses in their lives, what kind of things did you learn from them about how they were grieving? One thing that many of us men had in common was the drive to succeed. We all agreed we should have spent more time appreciating our spouses and families. 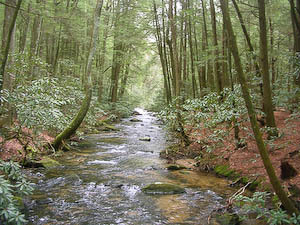 I hiked with several unbelievers who thought that this life was all there is. They carried a feeling of resignation, thinking they will never see their spouses again. I am convinced I will see my wife again and although I grieve my loss, I realize it is only a temporary separation. Many of my fellow hikers worshipped nature. I worshipped the God who created everything I saw and walked through. Hiking the Appalachian Trail became a spiritual journey as you worked through your grief in conversation with God, how was this different than when you were grieving in your regular life situation? Back at home I had my family and friends to support me. I also had the familiar surroundings of my job to distract me. On the trail I was alone—my only place of refuge was God. I am convinced God called me to the trail to reveal Himself to me. Near the beginning of Hiking Through you said, “On this trek, I would submerge myself in the traditions and life of the trail, and openly meet new thoughts and ideas. And I would leave behind my lifelong traveling companion, Guilt.” It sounds like a new freedom was found on the hike, can you tell us more about this? My upbringing was Amish and Conservative Mennonite and involved a strict set of rules to be followed. I was constantly reminded from the pulpit what I could or could not do. My viewpoint of God was formed in that setting. One misstep, and my eternal destiny was in doubt. On the trail I met Christian men with different backgrounds and beliefs than myself and their joy was apparent. I even hiked with a Catholic Priest on a sabbatical. I write in my book, Hiking Through, about a conversation between myself and the priest in a diner in Water Gap, Pennsylvania. We talked about the Cross, the resurrection and the grace of God. It was a sacred conversation that convinced me that God’s grace was so much greater than I had ever imagined, and my relationship to Him was dependent on His grace, not on my list of dos and don’ts. 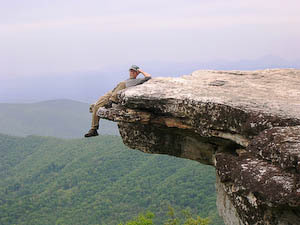 Most of us in grief do not have opportunity (or even desire) to hike the Appalachian Trail! How might connecting with nature in some other capacity be helpful to others on their grief journey? Granted, this hike is not for many people. It was the right hike at the right time for me because God had a message to give me, a message of great hope for folks in desperate situations. God created such beauty in nature, and I think it’s a gift to His people. A walk through a park or a flower garden can be healing. Even walking through a vegetable garden can be soothing. To imagine that a seed died and new growth emerged is so exciting. Our loved ones died so they could be given new life. Here is a question the visual part of my brain was wondering about as I read the book—what is the lightest weight way to keep a journal when every oz. makes a difference and has to be carried? I bought a notebook, tore several pages out of it and packed those to begin the hike. I sent completed pages home every few weeks; and whenever my home support team sent me a food box, they included several new sheets of paper. I also kept a journal on the internet at trailjournals.com and I would send updates from my BlackBerry. How was writing (both journaling and publishing a book) helpful to your healing? As I wrote the story, I was reliving all the feelings I encountered during Mary’s illness and death. To actually put my feelings into words and force them out through my fingertips onto a screen really put my loss in focus. I was able to write the story from the perspective of knowing how it ends—my wife died. As long as she was still with us, we had hope that God would heal her. I had not imagined how brutal and final her death would be. One of the casualties of losing a spouse is the loss of your stories. Writing Hiking Through gave me the chance to tell some of the stories that would otherwise be lost. Finally, it gives me comfort knowing my writings and stories in Hiking Through are giving hope to other people struggling through grief. Return from the Hiking Through article to bereavement books. Return from the Hiking Through article to read other bereavement interviews.